At the Nest West Garden Lodge, we asked to have breakfast at 7:00am, because we have planned a long day of walking from Tosa-Irino to Shimonokae, where we booked what we thought was a small rural hotel. We decided to walk at least 27 kilometers today. Our average speed while carrying our packs is about 4 kilometers per hour, if you include climbing steep hills, stone steps and forest paths. The advice that we were given, is to make sure to take a ten minute break for every hour of walking, or a five minute break for every half hour of walking. Regardless of this advice, we often have walked for hours with no breaks, because there are no shaded spots or benches to stop at on many roads, or because it is pouring rain. The walk today was into the southernmost peninsula in Kochi Prefecture. The landscape got greener and very beautiful, as we headed into the rural South. We found a quiet park along the way with a big pond and had a break, drank some tea and ate some nuts. A cheeky crab chased us away, since apparently we were sitting on a rock which was where he had his caves and tunnels. We honored his territorial attitude and walked away. After hours of walking, we came upon a Lawson’s convenience store. We always stop to use the convenience stores’ toilets, which are usually sparkling clean and new. We also bought some salads and sat on a shaded bench outside the shop, to eat our salads. A man came over to us and gave us two foot long baked buns as an Osettai (Gifts to pilgrims). We always try to eat light and avoid eating sweet breads and buns, but we could not refuse the man and his kind gesture. He saw us looking around the store and buying only a salad, and he decided to buy us those big buns. We tried to refuse but he just put them in our laps and walked away. After eating our small salads, Jules ate the plain sweet bun, but neither of us wanted to eat the one that was stuffed with thicks layer of cream and bean paste, and was covered with custard sugar. We thought to give it as an Osettai to the only other pilgrim that we saw today, but he was already gone. He looked so tired and spent when he approached us, but when we chatted, he told us that he only planned to walk for three days. We felt like old veterans compared to him. Jules suggested that we throw the huge cream bun away, but somehow it seemed very wrong to throw away a gift that was given to us by a kind and generous man. We decided to do a sneaky thing….. While some people steal things from stores, we decided to sneak back the bun into the store, and since it was completely unopened and still in its original plastic, to discreetly leave it on the counter and quickly walk away. So after arguing about who will sneak the bun back into the shop, I did just that. I went into the Lawson’s to wash my hands and buy more tea for the road, and nonchalantly left the packaged sweet bun on the counter and walked away. After a few more hours of walking, it started to drizzle. We passed by a clean and modern cafe and decided to stop and rest our feet. The owners of the cafe were welcoming and very kind. We ordered two iced Café Au Lait with some honey on the side as a sweetener. We tried to order something to eat, but the special of the day included meat, so we said that the ice coffee was enough. The owner, his wife and their son, made us some small pancakes drizzled with honey, and gave them to us as an Osettai. We accepted them with much gratitude. They asked where we were walking towards, and where did we plan to stay. I mentioned the rural hotel that we were headed towards, and they told me that it wasn’t a hotel but a Minshuku, a small and old guest house. When I asked if it was a nice place, they gave me a noncommittal answer. A polite way of saying no…. Before we left their lovely cafe, they packed for us two bags with sandwiches, a slice of cake and two small bottle of Yakult, a famous Japanese Probiotic drink that I like. We tried to refuse the gifts but they were very insistent and as we attempted to leave, the son went into the kitchen and came back with a new bottle of local honey, and added it to our already overflowing hands filled with their gifts. We walked out of the cafe into the rain and continued to walk South. For most of the day it was cloudy, but the rain was now coming down a little stronger. Jules had developed a blister on his smallest toe, and was walking a bit slower all day today. After about five kilometers, we came upon the place that we had booked for the night. The exterior of the building was dirty and looked very shabby. As we walked up to the front door, I felt that my heart was growing heavy, and my legs refused to go forwards. The place was dark inside and in the lobby, on both sides of the front door, were crates of empty beer bottles. I felt determined not to stay there. We walked around the corner to a phone booth and I attempted to call the two other guest houses in the area. As I was dialing, the owner of the guesthouse came out of the front door and came over to the phone booth. He looked like a man who enjoyed drinking, wearing a t-shirt that was so worn out, that pieces of fiber came out of it. His belt was untied and his face looked unshaven and forlorn. I shuddered to think about how the sheets on the futons in his room might look like, if he cannot afford to buy a new t-shirt…. Or chooses not to, since t-shirts cost next to nothing in discount shops…. He most definitely does not have nice clean sheets…. He tried to tell us that the guesthouse was around the corner, but we said that it was still early and we wanted to continue walking south a few more kilometers. He said that he had prepared dinner for us, and we felt terrible and very guilty, but we simply could not bring ourselves to stay at his place. We pretended to not understand his Japanese and said that we wanted to cancel the reservation. After a few attempts to change our minds, he gave up and walked back to the guesthouse. The two other guesthouses in the area were about five kilometers further south, but I was willing to continue walking, instead of sleeping in a dirty guesthouse. After being unsuccessful in trying to use the pay phone, I went into a nearby Lawson’s convenience store and asked the manager to try calling the two places and make reservations for us for the night. She called both places for me. The first one had no room for the night and the other was closed for the night. We had nowhere to stay. On a whim, I decided to ask her where the bus stop was to the Ashizuri Peninsula, and when was the bus coming. She walked with us out of the store and pointed to the bus stop. We walked to the bus stop, Jules limping slowly, and a bus arrived less than a minute later. I asked the bus driver if he was going to Ashizuri and he said yes. We felt so lucky that we had not missed the bus by a few seconds. If one of us had stopped to use the toilet, we would have missed the bus and had to wait for two hours in the rain. We still had no reservations for the night, and it was past five PM when we arrived in Ashizuri. Most rural Japanese inns and hotels offer a room rate that includes dinner and breakfast, and if they had not prepared ahead, they simply refused to give you a room. We thought to simply show up at the Hotel in Ashizuri where we had a reservation for the next night, and ask if we could stay an extra night. The bus drove on small rural roads, servicing all the tiny villages along the west coast of the peninsula. When we finally arrived at Cape Ashizuri, we walked to the hotel and felt horrified. The hotel has an Onsen hot spring pool, and the concrete below the Onsen was leaking water. The pipes looked rusted and leaky and not a single car was in the parking lot. The first floor where normally there will be a gift shop, a lobby and a front desk, had taped broken glass, torn curtains and junk standing in the corners. The lobby had no lights, and the place looked like a dump. This hotel charges $200 a night including dinner and breakfast, and without even asking Jules for his opinion, I said that we should go down the hill to the Ashizuri Kokusai Onsen hotel, which we had passed on the way. I had a quick look inside and thought to myself that it looked very nice. Jules asked me if I wanted to stop and look online to look at prices or other options, but it was getting too late. 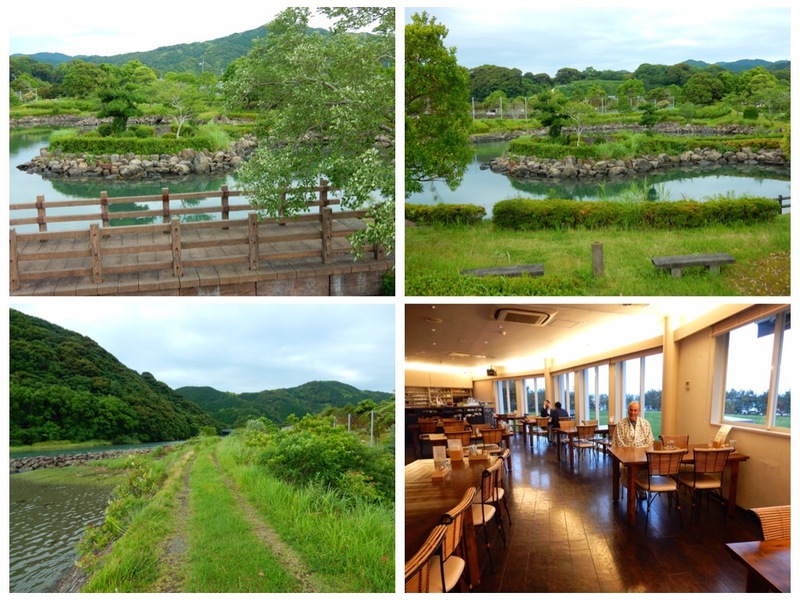 We walked into the Ashizuri Kokusai Onsen hotel which had big windows overlooking the ocean. The lobby was well-lit, and there were many friendly employees around the lobby and the front desk. I asked for a Japanese room for two nights, thinking that I would call and cancel our reservations for tomorrow at the Misaki Hotel. They told me that they only had a room for tonight, and that tomorrow they were fully booked. I accepted the room for the night which including dinner and breakfast, was also about $200 for the two of us. We were given a lovely ocean view Japanese style room. The hotel’s Onsen was awesome. There was an outdoor hot pool overlooking the ocean, and an indoor hot pool with soft silky waters. I was alone in the Onsen. They also had washing machines and driers, and while we were doing our washing, we soaked in the Onsen. Dinner was served in a private room separated by shoji doors. A table loaded with over twenty dishes, was waiting for us. We has brown rice cooked table side with vegetables and mushroom broth, a baked egg custard, a consommé, a grilled plate of seafood, Tuna Tataki, Shashimi, an array of appetizers which included prawns, eel, scallops, a noodle and mushroom dish, pickles, grilled mushrooms, squid, fruit, a delicious dish of Fugu fish with forest mushrooms, and more. We talked about how important it is to have a nice end for the day and to be able to wash up, eat good food and get under clean sheets. Jules made a silly joke, that as a rule, if the proprietor of a guesthouses is drunk or walks at a ninety degree angle or lower towards the ground, it is a fairly good bet that the place will not be clean and it is best not to stay there…. I shudder to think that this is what we have learnt so far after walking every day for 20-29 kilometers…. Do not stay in guest houses where the proprietor is drunk or bent at a ninety degree angle or lower…. Could you put it in the new Precepts?…..